Aristotle, an Ancient Greek Philosopher said, “Courage is the most important virtue because it guarantees all the others.” Without the courage to stand up to injustice, a person’s concern for fairness does little good to others. It’s only when we stand up for what’s right in difficult circumstances that we can really make a difference. At Bernardo Karate, we believe that knowing the difference between right and wrong is not always enough. We try to teach our students that we should not only do what is right but that we should have the courage to do the right thing and not just do what people think we should do. For us at Bernardo Karate, courage also means trying new things even if they scare us. John Wayne said it best; “Courage is being scared to death, but saddling up anyway.” And like most skills, we know that courage can be honed and increased through regular practice in every karate class. That’s one of the ways we help students become brave and courageous; by teaching them to push through their limits and improve themselves every day. We also teach that being courageous requires knowledge and wisdom. We don’t put ourselves in harm’s way or making rash decisions just to prove we are courageous and fearless. Through our martial arts training, we become more disciplined. We don’t act on impulses. We use the values and morals we are taught to exercise courage in a responsible manner. Our Bernardo Karate programs are designed to help students push, develop and progress at their own pace. As new students learn their first basic steps as white belts, we work hard with them to develop courage and the skills and ability to confront these challenges head-on. Building up courage is very empowering. Building up courage strengthens your ability to face your fears. This is definitely a skill set everyone needs to develop in order to be successful in life. Every student, including our Black Belt Instructors, are always encouraged to improve their skills, learn new things and reach for goals they thought were well beyond their capabilities. ← London’s Leader in Martial Arts for 30+ Years! 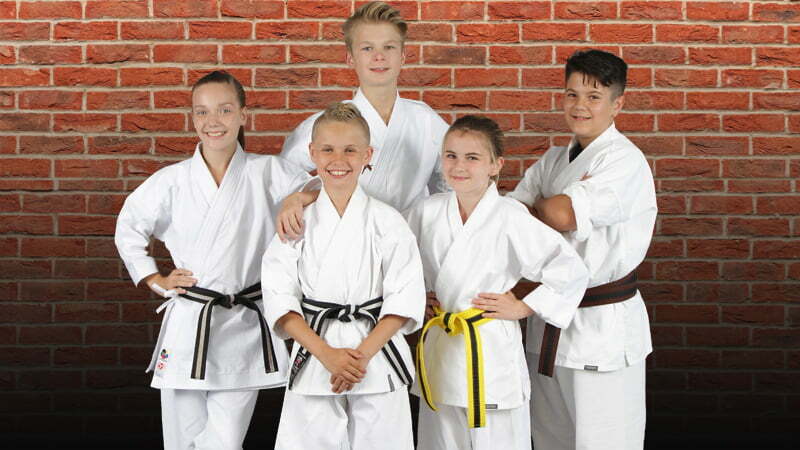 Bernardo Karate & Cardio Kickboxing strongly believes in developing the character of our students along with the martial arts skills we teach them. The Striving for Excellence character development program was developed with over 30 years experience in teaching children respect, confidence and self-discipline. Striving for Excellence gives our members the opportunity to discuss, practice, and apply character development traits in their lives.